The National Western Stock Show 2016 is back in town from January 9th through January 24th 2016 at the National Western Complex! The 16 day show serves as an entertainment arena, hosting one of the world’s richest regular season professional rodeos, the “Super Bowl” of Livestock Shows, nationally recognized Horse Shows and Colorado’s largest Western Trade Show. 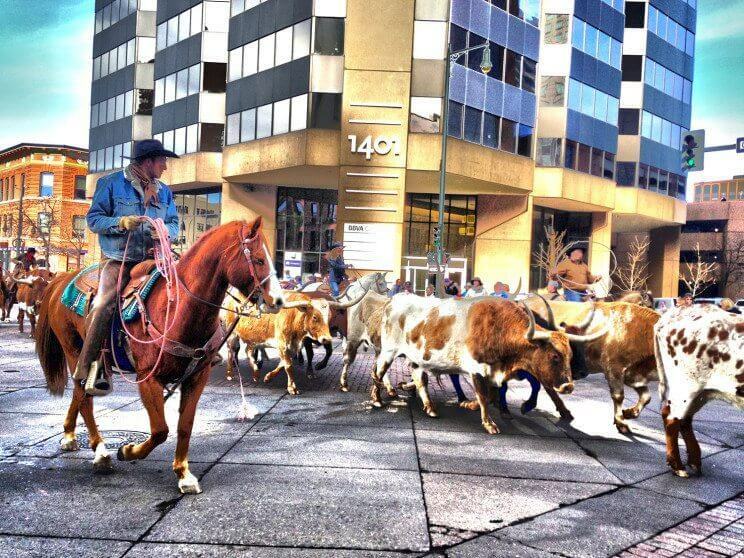 The sight of over a hundred Texas Longhorn cattle walking through the streets of downtown Denver means it’s National Western Stock Show time! The National Western Stock Show Kick-Off Parade is a sight to see with marching bands, floats, horseback riders, cowboys, cowgirls and Longhorn cattle. The parade starts at Union Station and runs down 17th Street on Thursday January 7, 2016 at 12pm. In conjunction with the parade is the annual National Western BBQ Lunch beginning at 11:30am in the atrium at the Wells Fargo Building. Visitors can listen to Western music and catch up on the latest trends at a Western Fashion Show. The BBQ is open to the public and benefits the 4-H International Youth Group. Meal Tickets are $10. The National Western Stock Show hosts nearly 20 breeds of cattle during its 16 day run. Visitors are able to view traditional competition among exhibitors of breeding animals ultimately used for seedstock in agricultural production (beef cattle, sheep and goats). National Western also offers competition among exhibitors of animals used primarily for recreation or companionship (llamas, alpacas, poultry and dogs). Viewing these events is all part of the Stock Show experience and can be done with a grounds admission ticket. Youth involvement is one of the highlights of the livestock shows. Young exhibitors from across the nation participate in their competitive arenas for prize monies, national recognition for their achievements and a chance at college scholarships. 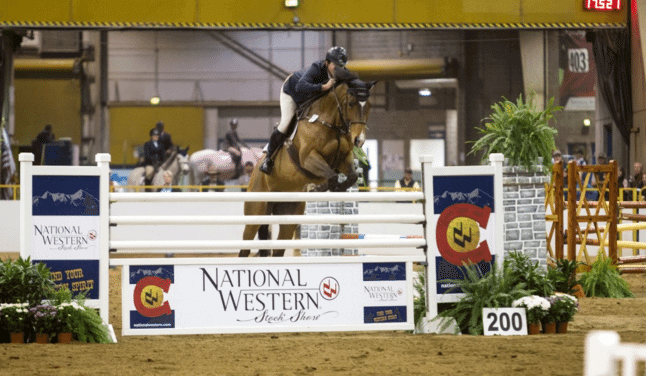 The National Western Stock Show hosts top equine athletes of various disciplines from across the nation as part of the Horse Show. Experience the Western heritage through entertainment and competitions of all kinds, including: Cowboy Mounted Shooting, a Ranch Rodeo, Cowboy Church, the RAM Invitational Freestyle Reining, a Quarter Horse Show, a Paint Horse Show, a Team Penning Show, a US Equestrian Federation Hunter/Jumper Show, a Wild West Show, a Reined Cowhorse Show, An Evening of Dancing Horses® and the famous Draft Horse and Mule Show. The National Western Stock Show hosts 19 Pro Rodeos, 3 Colorado vs The World Rodeos, 3 PBR Bull Riding and the popular CINCH Super Shootout Rodeo. 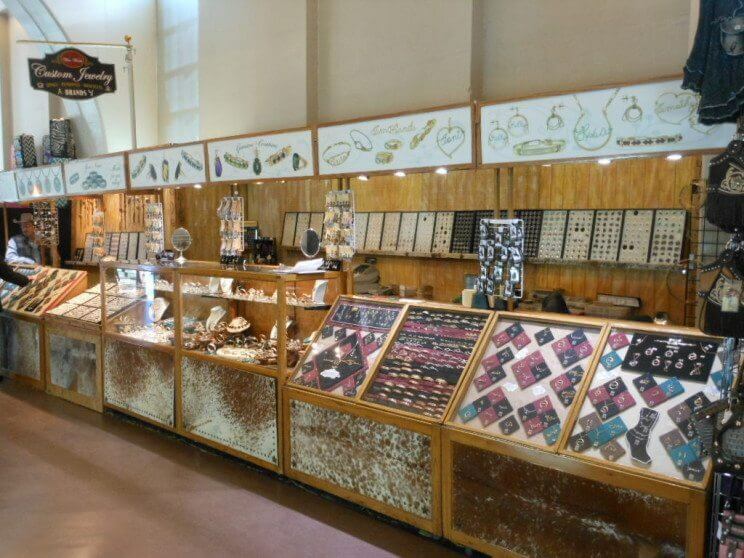 The National Western Stock Show exhibit space occupies 900 spaces made up of a variety of products including fine art and jewelry, clothing, household items and agricultural products and equipment. These vendors are placed throughout the complex, where over 600,000 guests mingle and shop. National Western BBQ Throwdown: The second annual BBQ Throwdown will take place Saturday, January 9th, 2016 from 10am – 4pm. 40 teams will compete in a wide range of categories including pork, ribs, chicken, and brisket. Each team competes for the coveted Grand Champion and Reserve Grand Champion titles. The BBQ Throwdown will also be the first opportunity in 2016 for competition barbeque cooking teams to earn points for the coveted KCBS Team of the Year. The event is FREE with a Grounds Admission ticket, and festivities will include BBQ competitor viewing, live music, culinary demos, grill giveaways, food and beverage vending, and a kid zone. Catch-A-Calf Contest: The Catch-A-Calf includes the placing of the calves in the Stadium Arena on January 10th 2016 at 10am and is FREE with your Grounds Admission ticket. CINCH Equicross: The CINCH Equicross is a gymkhana style rodeo consisting of four events: Rescue Race, Key Hole Race, Ring Race/Musical Ropes and Flag Racing. Contestants are 14-18 years of age and compete for scholarship money. This event will take place on January 14th 2016 at 2:30pm. Colorado Fiddle Championships: The Colorado Old Time Fiddlers’ Association (COTFA) is dedicated to fiddling of all kinds, with a special emphasis on contest (Texas Style) fiddling. This event takes place on the opening weekend of Stock Show in the Beef Palace Arena. The Nickel: Celebrate the National Western Stock Show with two dinners, in collaboration with 7X Beef and Western Daughters Butcher Shoppe. The 7X Beef Stock Show Tasting Dinner will take place from 5pm -10pm on Wednesday, Jan. 13th, for $65 per person, guests can savor a three-course tasting menu that explores the seasonal flavors of The Nickel and 7X Beef. The menu includes beef tartare with miso onion puree, furikake and beef tendons; oxtails with beef consume; and 7X NY steak with bone marrow emulsion, fondant potatoes and king trumpet mushroom. The Western Daughters Stock Show Dinner will take place from 5pm -10 pm on Wednesday, Jan. 20th. The Nickel will collaborate with Western Daughters to offer a special Stock Show dinner. Large-format beef entrees will include bone-in dry-aged ribeye and bone-in porterhouse, served with bone marrow and family style side dishes. 1100 14th St, Denver 80202. For reservations call: (720) 889-2128. Have a very Western January!